Rough Triangle are a DIY collective who will be performing Every Building Tells A Story. Every Story Collapses Eventually, an exploration of urban life through chaotic comedy. Rough Triangle is a collective of performers from London. We make theatre and performance work that is not usually from a script and engages the audience in a fun way, but doesn’t shy away from big themes and political issues. We think going to the theatre should be enjoyable but should also open you up to new ideas and concepts. We all come from slightly different areas of theatre and performance, we have a writer and a clown amongst us, and I think we all bring really varied things to the collective. 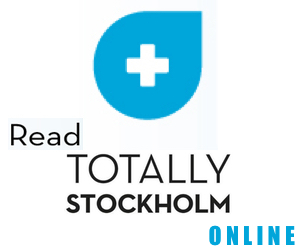 We have shown work in Leeds, London and Exeter in the UK, so this is our international debut and we are really excited about coming to Stockholm! Gentrification and the housing crisis are immensely important topics right now. Is that what drew you to cover it in the performance? The housing crisis in the UK is particularly notable in London, so as a collective, we all have lived experience of what it feels like to have to live with your parents, or be caught up in an endless cycle of rental contracts that don’t give you much security. 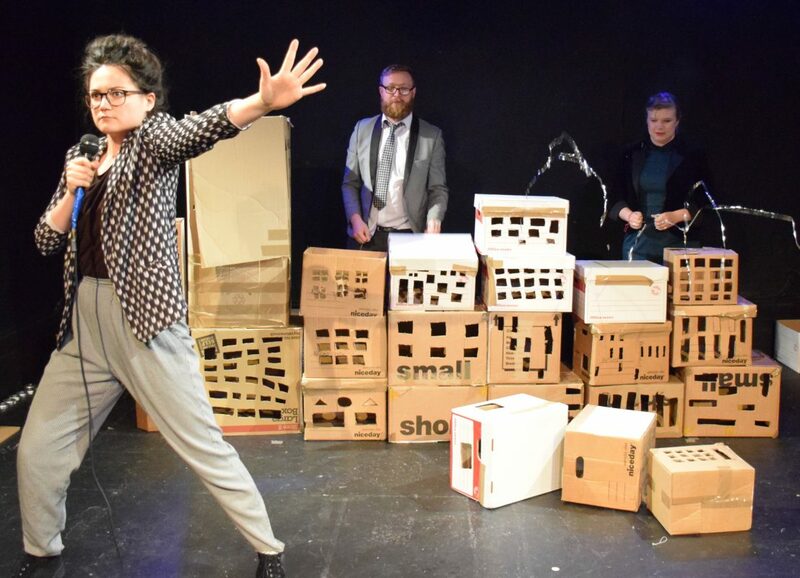 We didn’t want to make a performance that preaches about it so we go about the subject in a slightly different way, telling personal stories and autobiographical anecdotes about the idea of home and buildings, bringing them all together thematically. It is interesting that it seems to be an international crisis and no country or city seems to have got the balance right yet. In these housing crises and gentrification situations, estate agents take on an almost mythical status as the power behind the scenes. Was that a major part of the idea to make the performers estate agents or people “who look suspiciously like estate agents”? We have one scene that parodies the language of estate agents here, which can stretch the imagination. The slightly manic energy we bring to performance can also be interpreted as a bit like estate agents too, slightly too convinced of their own ideas. As the estate agent industry in the UK is so unregulated, many companies don’t play by the rules. The stage set-up is largely made of boxes, leading to descriptions of the performance as “unrivalled cardboard anarchy”. Does having that kind of set-up allow an extra level of on-stage improvisation and spontaneous creativity with the scenery? There is playfulness and anarchy throughout the show but we have one particularly anarchic scene which people tend to love because it is very full-on, loud and intense, at the end of the scene we all are out of breath and very sweaty! The cardboard boxes mean we can swiftly change the stage imagery and surprise the audience with some really striking visuals. They also represent the idea of constantly moving house, which is often what happens in London. Our style is quite informal and improvised so the cardboard set supports that as we can play a lot with it. I think people are often surprised by quite how much we can do with some cardboard boxes. Is there anything you’d like to say to potential attendees before they see the show? Our show is fun, surreal and serious all at the same time, it is always a unique and different show because of the improvised elements and the way we approach making work. It explores the parallels between the construction and destruction of buildings and in performance. It is a show that has lots of surprisingly funny moments, and some quite moving ones, but really it is a performance with a big heart and it is about a topic that all the performers in it are really passionate about. Also, it has a really great dance at the end! Every Building Tells A Story. Every Story Collapses Eventually plays at Teater Tre on Oct 7.